MZ just recently released more research, for the Gem Set Tree. Seeing as Super Wonder is a week away, the timing of the release, should come as no surprise to veteran Game of War players. If you plan on finishing it anytime soon, be prepared to pay, a lot. It currently requires around 4.5KT(4,500T) of Wood, Stone & Ore (research does not require food or silver). Assuming you have no resources, it would cost you 45 bogo sets ($6,750), with current packs (50T RSS per pack). Completion of the tree brings Research Power to 436.6B. Is it worth it? Looking at the raw stats, the answer is yes. Completion adds increased Health, Attack, Defense, and march size. Yes, march size. MZ said no new additions to the march tree, but apparently that didn’t mean they wouldn’t add march size increase, elsewhere. In theory, it works great, as long as the defender doesn’t have the first levels of the research as well, or it just gains overpowered defense, frustrating most rally leaders. Here is what you will gain, for completing the new portion of the Gem Research Tree. Individual troop type 500% Attack, 1000% Health, and 500% Defense when hero is present. Rally and Wonder Troop Attack, Health, and Defense. 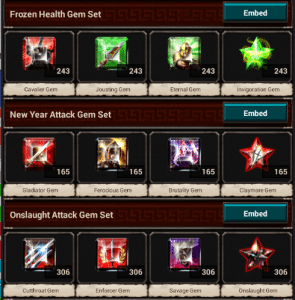 Extra Boosts on all gem sets. This research seems to be benefiting both sides. Traps with the new research are showing that they are overpowered in low levels, which is making it frustrating for rally leaders. MZ is currently running Gem Set Research events, so try to complete your research with those, to at least earn some payback. I stopped by to check in on the old game. I quit over 1.5 years ago and I can’t believe players are even trying to do these new research trees, etc. Especially when you have to buy packs for every single thing. You are gaining nothing for your money except digital junk that will be devalued 2 weeks later when MZ pumps out new stuff to spend money on. $6750 dollars for new research? How does that make sense? You can buy a car or put it down for a mortgage instead. Unbelievable. How many other gaming consoles and games can you buy if you just stopped playing GOW for one week? This games a joke! And everyone still dumping money in it doesnt get the punchline yet….YOUR BROKE! ?? I haven’t been on the game for 1.5 years and just seeing where the stats are at now makes me glad I quit. How do you count all the zeros anymore. Soon power will be in the quadrillions with millions of days of speeds required. Cities have more than the population of earth. It’s all a big joke. Surely there can be no sane way that spending £5000 can be said to be worthwhile – regardless of the fact that the ‘benefit’ it brings will be out of date in 3 months …?